Join the race to become the wealthiest son of a gun in West Texas! The year is 1922. The Texas Oil Boom has been in full swing for 20 years, and greedy landowners have laid claim to most of the oil reserves. Prepare to head West, surveying the Permian Basin for profitable gushers and gaining more wealth than your fellow prospectors, before the companies of East Texas sweep in and stake their claim against you. 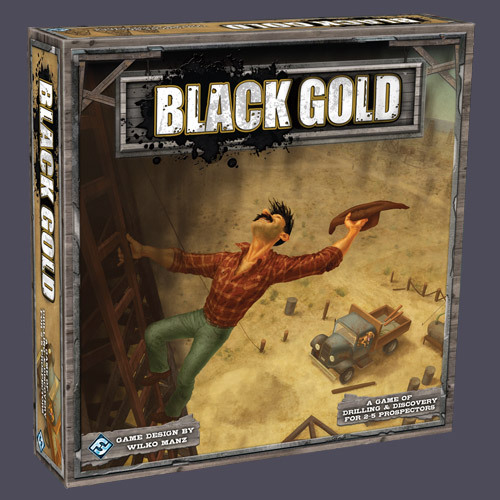 Black Gold is a game of drilling and discovery for 2-5 prospectors, and play can last from 1-2 hours. Offering an abundance of intriguing gameplay choices and optional rules, Black Gold presents a new experience of strategy and exploration every time. The historically inspired and detailed game components, together with the tense and exciting atmosphere of warring against your fellow prospectors, will almost have you speaking with a â€˜twang!